The SVGS Corner is a place to catch a glimpse of the daily life of Shenandoah Valley Governor’s School Sciences students. Here you will find articles about the special opportunities SVGS offers in its classes as well as the research projects and capstones our juniors and seniors are hard at work on. Check back regularly to keep up-to-date with SVGS Sciences students! Student involvement at Shenandoah Valley Governor’s School is not just limited to school hours. SVGS also offers three clubs for its students, including robotics, electric-vehicle team, and the outdoors club. Let’s take a closer look at the robotics team—it’s the height of the robotics season, after all! The robotics team, also known as Team 3361: The Governators, is coached by Mr. Chris Martin, who teaches physics at SVGS, and who is helped by other governor’s school teachers. The team is comprised of students in grades 10 through 12 who either attend or plan to attend SVGS.To be a member of Team 3361, students don’t have to be knowledgeable in programming or engineering. They just have to be interested in learning! Ben Rochford, Sam Brown, and a team advisor work to complete the robot. The robotics build season takes place for a six-week period beginning in January and ending in February. Teams have this limited time frame, starting the day the year’s theme is announced (for 2019, that date was January 5th) until the stop-date (February 19). The teams must strategize, plan, and build their robots in this short time period. This time constraint adds both a challenge and excitement for the teams. At the end of the six weeks, each team must wrap up its robot and is prohibited from working on it until the week leading up to its first match. The theme varies each year, but the basic rules of the challenge remain the same. Teams from all over meet at competitions to test how successful they have been in both strategy and construction of the robot. At each match, teams compete for “ranking points,” which are points a team can win by either winning a match at a competition or by fulfilling specific tasks. The 2019 theme was Destination: Deep Space (to watch a detailed video explaining the theme, go here). The Governators’ strategy for the year was to focus on earning as many ranking points as possible. For 2019’s theme, ranking points may be earned by the robot successfully climbing platforms or successfully filling a rocket with supplies. Each match at a competition is a short two and a half minutes, so the team found it necessary to pick just one of these tasks. The Governators decided that giving the robot the ability to climb was their best bet. Choosing a strategy was the first challenge, but the execution of this plan was much more difficult. One of the challenges the team faced this year was a climbing mechanism that failed on stop-day. With a little perseverance and teamwork, however, the mechanism was successfully fixed on time. 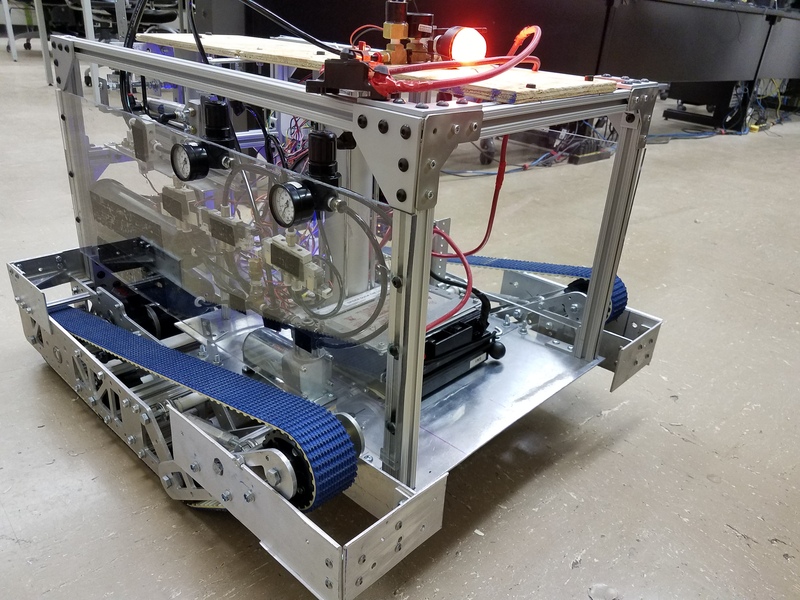 The Governators’ completed robot, ready to compete in the 2019 robotics season. As coach of the SVGS robotics team, Mr. Martin has enjoyed many different things about working on the robot and seeing it come together. By far, though, the most fulfilling aspect for Mr. Martin the people: “Getting to interact with students outside the classroom on a long-term project helps us get to know one another better, and I am always constantly amazed at what our students can do . . . That moment when a component finally works for the first time after repeated failures, and we all excitedly celebrate together—there’s just nothing like it.” Experiences like these, including long evenings bonding over pizza and confronting challenges, are what makes robotics so great. Mr. Martin also encourages inexperienced students to join robotics, as there is a job for anyone at any skill level. Most students, he says, aren’t experts when they join. So, any person interested in becoming a member of the team should give it a try! To keep up with the Governators, follow them on Instagram, Twitter, and Facebook @Governators3361. Also, for more information, visit the team’s website, found here.